Helpful if 2 and 3 have good shooting range. 5,4 - Screen outside defenders to free up 1. 2 - Dives to the basket. 1 - Might have a quick look, but other options are more effective. 2 - Runs off of 5's screen to baseline corner. 3 - Sneaks wide weak side behind defenders. D3 will try to cheat over the top of the screen. When this happens, 5 sprints to the middle zone defender and screens for 4 diving the lane line. After 2 receives the pass, they look for their shot or to dump the ball to 4. 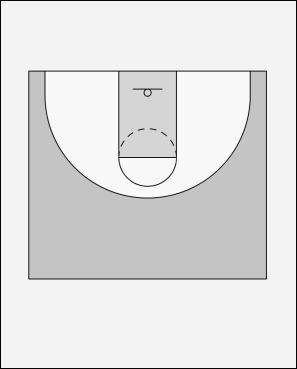 If the pass from 2 to 4 is not open, 5 moves up the paint to set a screen at the high post. 2 reverses the ball back to 1. 1 Runs a pick and roll with 5. If D5 follows 5 high, 4 should back screen for 3. Off of the screen, 1 should luck for 2 cutting back door, their own pull-up jumper, or a draw and kick to 3. If the shot goes up, 4 is in great weak side rebounding position. If 3 is not open, 4 likely closed out. 2 continues to cut across the paint, and could be open behind D4 briefly. Or the ball can go to 5 flashing to the strong high post for a high low with 4.